Ripple price formed a decent support near $0.3200-0.3210 and recovered a few points against the US dollar. There is a short term declining channel forming with resistance near the $0.3450 level on the hourly chart of the XRP/USD pair (data source from Kraken). The pair could move a few points higher towards the $0.3500 and $0.3600 levels in the near term. Ripple price is trading with a few positive signs against the US Dollar and Bitcoin. XRP/USD may perhaps recover higher if bulls continue to hold $0.3200. Yesterday, we saw how Ripple price managed to hold the $0.3199-0.3200 low against the US Dollar. The XRP/USD pair later started an upside move and recovered above the $0.3350 and $0.3400 resistance levels. There was even a break above the 23.6% Fib retracement level of the last major drop from the $0.4137 high to $0.3203 low. However, the upside move was capped by the $0.3550 and $0.3560 resistance levels. Moreover, the 38.2% Fib retracement level of the last major drop from the $0.4137 high to $0.3203 low prevented upsides. The price is currently moving lower towards $0.3350. More importantly, there is a short term declining channel forming with resistance near the $0.3450 level on the hourly chart of the XRP/USD pair. It seems like the price is trading sideways above the $0.3200 level and it could make another recovery attempt. Should there be an upside break above the $0.3550 and $0.3600 resistance levels, the price could rise towards the $0.3670 level and the 100 hourly simple moving average. Looking at the chart, ripple price is under pressure, but the $0.3200 support zone holds the key. Below this, the price will most likely tumble towards the $0.3000 level in the near term. Hourly RSI (Relative Strength Index) – The RSI for XRP/USD is declined back below the 50 level. 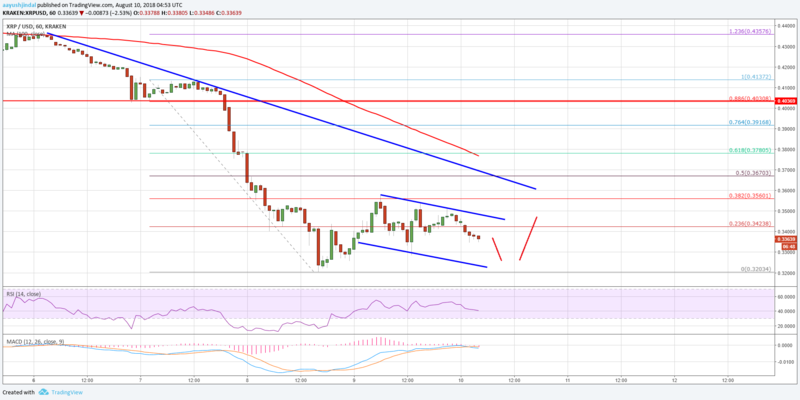 The post Ripple Price Analysis: XRP/USD Rebounding Positively Above $0.32 appeared first on NewsBTC.